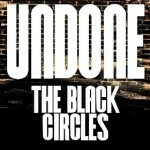 Share the post "Album review: THE BLACK CIRCLES – Undone"
The Black Circles is a power trio from Warrington who made an initial splash with their ‘From The Top’ EP/CD, released about a year ago. Those 4 tracks are all included here and accurately reflect the band’s quiet-to-loud approach to contemporary rocking blues. ‘Undone’ further amplifies the dichotomy with the paint stripping rocking blues of ‘Gypsy Girl’, to the acoustic-to-electric deep blues of ‘Drifting’, which wasn’t on the EP, but confirms their genuine feel for the genre. ‘Undone’ emphasizes the dynamics of individual songs, as well as the contrast between the tracks as a whole, on an accessible rock-blues album that drips with commitment and flows from beginning to end. The band is mentored by multi instrumentalist Jesse Davey from The Hoax, who pops up on Hammond and keys and also masters the album. It’s tempting to view The Black Circles as sounding like The Hoax 20 years on, while at their most belligerent they also recall Scotland’s Blues ‘n’ Trouble, albeit in both instances without the blues harp. They also mine plenty of other familiar influences from Stevie Ray Vaughan on ‘She’s Dynamite’ to the explosive industrial grungy blues of ‘I’m Leaving’. The latter evokes Gary Clarke Jr., but it’s their brand of ripping live in the studio intensity that marks them out from their peers. Front man Sam Bratley also has a distinctive husky vocal that colours some of the songs distinctively, but will test listener’s patience when he occasionally strains to emote a phrase. For example, he is at his best on ‘Don’t Mean A Thing’, but he loses his discipline as the band rock out on ‘Gypsy Girl’. ‘Undone’ sounds old school and is none the worse for that, as the swaggering shuffles of ‘She’s Dynamite’ and ‘Hard Times’ sound like a road tested band, as Sam’s deep toned guitar rises above the punchy rhythm section of bassist Martin Saunders, and drummer Phil Wilson who also mixed the album. The band’s material is a familiar melange of intense rocking blues with power shuffles and slow blues. They expand their song writing skills, emphasize the steely riffs and fatten the grooves while channelling their natural exuberance into something unique. They also add a spiky opening narrative – “you’ve got a mask for every occasion” – on the spacious slow blues ‘Stop Acting This Way’, which is a showcase for Sam’s deep toned chops over Davey’s layered Hammond. Sam is joined by vocalist Cat Fullbrooke on the confident opener ‘One Big Lie’ and the pair also duet effectively on the Hammond led ‘Don’t Mean A Thing’, which is a surprisingly soulful blues outing that fits well with the current penchant for while boy soul. She’s also an important part of the rip-roaring call and response ‘Left Behind’ which book-ends the album with the band’s essential bluster. The best moment comes on the show building cool blues of ‘Bad Luck’, on which Sam’s impassioned vocal bring real feel to some overly familiar themes. This entry was posted in ALBUM REVIEWS, ALBUM REVIEWS (Mobile), All Posts and tagged album, blues, Blues N Trouble, Cat Fullbrooke, Gary Clarke Jr., Jesse Davey, Martin Saunders, Phil Wilson, review, rock, Sam Bratley, Stevie Ray Vaughan, The Black Circles, The Hoax, Undone. Bookmark the permalink.